I have always loved language. Words have power and meaning can shift with the substitution of a single word in a sentence. It was my love of language that led me to explore Arabic in college. I enjoyed carefully making each loop in the foreign letters and relished the fact that a missing dot could change a word. I appreciated that the language followed a strict and well-organized root system. Love for that language led to a Middle Eastern Studies degree and later, a Master’s degree in Islam. As a result, Islamic art in the form of geometric tile work from the great Muslim palaces and mosques of the world became a source of inspiration for my quilts. 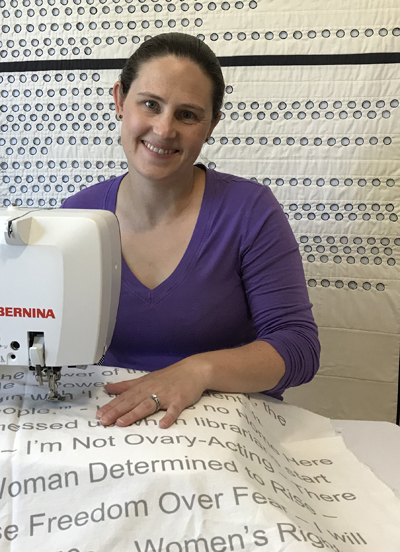 I soon felt the need, however, to make more a statement with my work and I began a series called “Protest Quilts.” I use the soft form of fabric to grapple with the hard subjects of women’s inequality, xenophobia, and mass shootings. Each quilt begins with a statement of intent, sometimes overtly political and other times simply “Remember.” I then create the quilts, often incorporating words themselves in English or Arabic, imbuing meaning stitch by stitch. Illustrations for: Ravaging Rio and the Ghost in the Library, self-published, 2016.